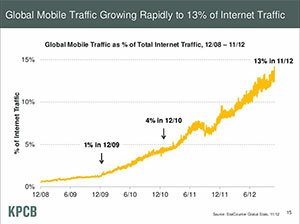 Global mobile traffic has continued to grow rapidly in 2012, as expected. As of last month, it is estimated that internet traffic from mobile devices grew to 13%. This represents a growth of 200% in the last year alone! Based on the combined web statistics of our clients, mobile devices account for nearly 20% of web traffic in Australia. Mobile device users often express their frustration about websites that seem to load slowly on mobile devices, the difficulty in navigating the site, and hard to read information. Many websites simply won’t render correctly on mobile devices, leading to lost opportunities. Browsing and purchasing online on-the-go is an ever increasing trend, one that we think many Australian businesses aren’t taking seriously enough. Being part of a community gives life a rich dimension. Yet organisers have always struggled getting their message to their own communities of interest and recruiting from the broader public. One innovative city Coffs Harbour, on the beautiful Australian east coast is surfing the wave, literally. There are of course many ways of getting community messages out there, some more effective than others. We've all seen the creative hand drawn poster at our local super market announcing a school performance or church fund raiser, sometimes they just hit the mark, other times they become covered in other pin-up sheets for window washing or amazing get rich quick schemes. Others turn to community radio to get their message out to their public. It's a complex task to set up a radio station and expensive and time consuming to get it right. Most popular these days is the email newsletter. OMG this is a headache, yet it has been one of the Internet's massive growth areas for 15 years... "Please stop" I hear you cry! Now people are dabbling in video production, using YouTube etc. to distribute the good word and showing off some of their winning ways. Video is potentially very effective, as the growth in video views online has skyrocketed in line with faster networks and great archive services. Many internet users have YouTube accounts with some attempt at home video. So much so that YouTube is the world's second largest search engine, after Google itself. Yet how to produce, find, organise and/or distribute your videos is a challenge. YouTube encourages browsing and you can find yourself totally lost, watching videos of obscure fishing lessons from Iceland or some such. Fun, yet not entirely community building. One innovative local community took the challenge of building their community online with a good quality, well organised solution called PixelMache.tv . The result is SwitchedonCoffs.tv an evolving community internet delivered TV station with six channels full of interesting content ready for their community to watch, produce and publish. Check out the channels and some of the quality articles that have been produced by this innovative community. Contact them for more information or contact Organise.net.au to have them start your own IPTV channel. Training, equipment, support and system all inclusive. Much is written and talked about the so called Cloud. It's a soft and fluffy term at the best of times and as witnessed here is full of mixed metaphors and analogies. OI has been working with cloud technology for years and we know it CAN work if applied in a sensible collaborative fashion. More importantly we should ask "what is it and what can we use cloud technology for?" Cloud technology is best described as shared services through the use of internet servers that are located, not in your office but somewhere out in internet server world. This somewhere is The Cloud, you can see it but not touch it is how the analogy goes. In fact your data and services can be hosted anywhere really, as long as they are reassembled and delivered in the right place at the write time. The focus is on the service NOT the physical infrastructure. After all it is services that are important, be it important emails, document access or computational processes that give you the answer you're looking for. In other words it allows us to concentrate on working together to get things done, some would call this "Teamwork". We're pleased to be the lead Australian distributor of the successful cloud based collaboration tool called vTeam. As the name suggests the vTeam helps manage groups of people in a collaborative framework that get things done, without the usual technology confusion. It works from anywhere on the internet of any device. The service can be used to coordinate groups as large as 100,000 people or teams of three or more. It's been applied in industries as diverse as construction, education, volunteering, community engagement, sport, dramatic arts and travel. The service can be white labelled to create a seamless integration with your existing web or mobile services and is simple to set up and manage. Contact us for a run through of this fantastic cloud based collaboration tool. 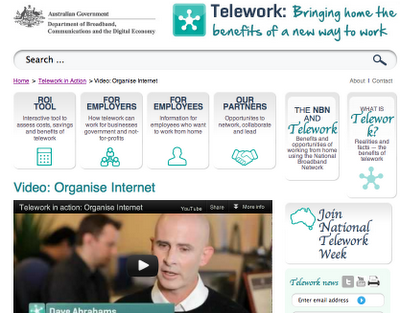 Organise Internet has been featured on a new national Telework website ( www.telework.gov.au) as part of a campaign put together by governments and companies from around Australia. The campaign will climax during the National Telework Week, November 12-16 . Our Principal Consultant and co-founder Dave Abrahams was asked why supporting a flexible work culture is part of supporting staff and how, in a broader sense, telework will help get people off the roads and rail and back into their local communities. OI's Technical Manager Craig speaks about his regular telework and why it works for him, his family and the company. We don't think it's such a big change to our innovative culture where supporting the team is the heart of all we do. While many companies around the country are outsourcing their skills to offshore third parties, effectively diluting their innovative energy, we've decided to build our team by adding flexibility. The team may not be always (or ever) in the office but we want them always to be part of the team. With the NBN investment, we're building our work culture toward a future that will be increasingly locally based with a global reach. Ask us about some of the cloud technologies and innovations we're working on that will work for you. The internet is changing fast and we’re moving fast to help you. As a result we are upgrading our servers to make our internet services, including our web systems faster, more secure and more efficient. For most of our customers where we look after your domain names, you will not notice much of a difference. Though we trust you’ll feel a little faster and more secure. For customers that for one reason or another control their own domain(s), expect to receive an email with important instructions on how to redirect your domain to maintain your online systems. As you've come to expect, our new servers are hosted in Australia in geographically separate locations (Sydney & Canberra) in one of country’s most secure server networks. This will enable us to maintain our excellent up time record and to maintain short turn arounds on your system issues. Did you know that the time we all spend online has risen by over 300% in the last 5 years. We’re seeing a major move to online shopping and transactions, these need fast servers with robust backup routines. Did you also know that Australia’s online traffic grew by 241% in the 12 months 2010 - 2011 according to the ABS. This puts brand new speed demands on the performance of servers. You may also know that many companies are looking to move their business systems to the Cloud to reduce costs and speed up efficiencies. This is a sound and tried solution on the whole. We’re happy to show you how to create a strategy to make this happen. Organise Internet has internet veterans that know the internet inside out. Indeed some of our team helped bring some of the first organisations onto the internet in the 1990s. Sure we also have high class graduates and programming gurus. Together our ‘team equation’ works to deliver exceptional innovation at sensible business rates. So if you have an great idea talk to us. Organise Internet has been moving clients to online based services for years, we’ll show you the rewards and the potential risks. Organise Internet is one of the country’s first Google Engage Partners. We also employ a specialist search expert that brings extreme search success to our search clients in a professional and consistent manner. Did you know that smart phone use is growing at the rate of 400% per year. Much of this is leading to a quiet revolution in the use of the web for search. That's why we've have a mobile specific platform to our clients called YouCardQR. Think about your own use. What do you or your family do when they are searching for a local business they just heard about in a conversation? Sure there are some that go through the old Yellow Pages hunt, though most pick up their phone and type in a search query, like 'gluten free pizza', 'tea house', 'insurance agent', 'chiropractor' or 'fruit store'. All of those searches above and more will return local results first, if you've set your site up correctly. Assuming of course that you have a website for your business. Remember most smart phones know approximately your location through their GPS or WiFi systems so they will look for reputable local business sites. BUT if your website is made for a large computer screen, what does it look like on a mobile cell phone?For most people the answer is "pretty small and difficult to read". 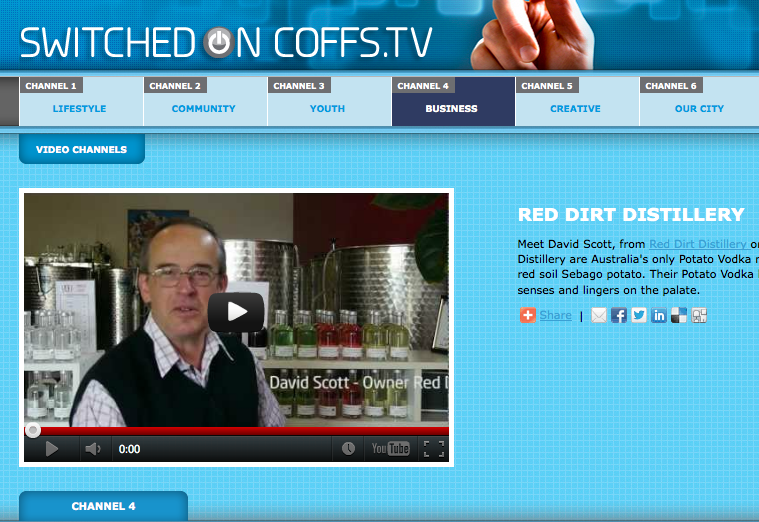 This short video will explain the difficulties of relying on your old website. It's not just about the size of the website. Remember that a mobile site will be used with a touch screen where people expect to be able to touch and call you phone number, touch and link to your map location, touch and link to you FB or Twitter page. 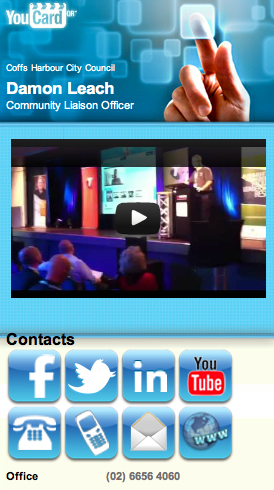 Our YouCardQR platform has all these links in them natively with big buttons and quick links. See an example below of one of our customers. After a recent visit to South Australia to assist in the launch of a so called Digital Enterprise Centre I came away with a tasty new view of economic development. The village of Willunga in the vales south of Adelaide is renowned throughout the cycling world for its infamous hill that is an annual fixture in the ever-expanding Tour Down Under. The three-kilometre hill is broadcast to tens of millions of viewers each and every January, as the world's best cyclists fight each other for the title of 'King of the mountain'. Yet Willunga and the surrounding district is also a centre of both local fresh food markets and the super-high-speed internet through the National Broadband Network (NBN) pilot program. The village is therefore an eclectic mix of events and possibilities that on the surface don't naturally fit together. Yet, I soon discovered 'oil and vinegar' make for great salad dressing. The farmer's market in Willunga is held every Saturday morning in the town square and features both real farmers and real local food. As a result it has won local, state and national awards for its food and atmosphere. Locals walk or ride their bikes to stock up on fresh food, wines and bakery items. Others also come from as far away as northern Adelaide to get the best and freshest food that can be found. In many ways the area has echoes of provincial France or Italy, and its older colonial homes and small churches complete the milieu. The farmer's market organisation, though, has also been infected with innovative ways. The marketing and development managers have spawned the idea of replicating the real market place as a Virtual Farmer' Market, which has set heads a-spinning. The idea that has been prototyped allows people to walk through a virtual market in 3D and visit the tents and stalls as they are in reality. The young team that's working on the project has been inspired by the possibilities their local NBN roll out has afforded them: the opportunity to create new and innovative services to augment the market is driving optimism and change. Billy Doecke and Dave Abrahams at the Willunga Markets. Photo courtesy of Dave Abrahams. Billy Doecke, part of the innovation team, speaks enthusiastically of the possibilities of the emerging new 3D service. She says they’re hoping to create video introductions of the stall holders so people can get to know them before they arrive and purchase produce. They’re also keen on getting the sellers to list what they are selling each week so people can view online what will be sold at the markets on Saturdays. Now, having left Willunga, I feel a little sentimental - not so much for their provincial setting and fresh food, but for the positive and innovative atmosphere that they are building on the back of their NBN roll out. I hope to be able to inspire a similar change in my regional economy when the NBN rolls out on the Central Coast of NSW later this year. Perhaps fresh local food, wine, optimism and superfast networks can deliver a new economic renaissance to many regions across Australia. Oh, and with such high speed 3D virtual reality don't forget your bicycle helmet. Article originally published on myregion.com.au. The term 'Social Business' is accelerating through the modern online vernacular and for good reason. Businesses and organisations, governments and NGOs are all frantically trying to apply a largely personal technology to enhancing business outcomes. The big question remains. "Does social media lend itself to profitable business applications?". The risks are clear from a manager's point of view TIME WASTING. Though there are clearly some examples, that have worked, at least in raising the profile of various campaigns. Used in a disciplined way some savvy organisations are making social media work. One such organisation that has turned the use of social media on it's head was the successful European airline Norwegian. They recognised that people wanted to use social media all the time, so they made it available for all their travelling customers during the entire flight for free. They certainly gained a lot of goodwill and cashed in on the service big time. 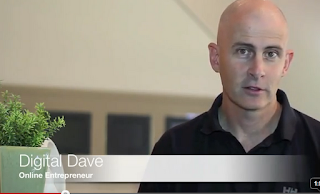 In this video OI principal consultant Dave Abrahams talks around the opportunities around travelling. See also our Social Business Retail blog entry here. What does an addiction to social media mean for the work place? Well if you jump on the stereo-typical bandwagon we'll be thinking about stupid rude teenagers in customer service roles. Though this is way too simple, most employees have social media accounts these days and most of the keenest new users are middle aged. How many hours do you use on "Social Media Production" at work. We suspect for some of you it maybe a fair amount of time. The next question is how effective is the time used. 1. Are you repeating yourself on Twitter, FaceBook and YouTube etc? 2. Are you communicating effectively to the right people in you social media channels? Why not put a little effort into moving some people between your various account. Take some of your prospective customers from FaceBook and Twitter, move your professional contacts into a LinkedIn account. Or invite people to watch your conversational video on Google+. We've witnessed some great success with our branded online video customers using PixelMache.TV to distribute their messages. How would a few thousand extra video views work for you? When you think of what that amount of customers would do... you get the idea.